Click on the photo to the right to see the finished pants in more detail. Wash fabric to pre-shrink it. Dry it. Iron flat if necessary. Cut two 45-inch squares from the fabric. Set aside extra fabric for waistband. Fold each square from corner to corner across the diagonal to make a right triangle. One cut edge will be next to a selvage. Pin along the length of this edge and then along the other. Leave the pins in place. Lay the two triangles flat with the two straight edges parallel to each other. Using tailor's chalk, mark a rectangle at the right angle 3 inches wide and 12 inches deep. Round off the bottom corner as shown on the diagram. Cut along this line through both thicknesses. This will be the crotch seam. Repeat on the other triangle. Stitch the shorter straight edges together on each triangle starting at the crotch edge and leaving 7 inches open at the bottom for the leg opening. Pin the triangles together along the length of the crotch seam and stitch it. Cut a waistband from the remaining fabric - just use the whole width of the fabric if your hips are less than 43 inches. If your hips are larger, you'll need to use additional fabric. The waistband will be 3 1/2 inches deep. Bring the two ends of the waistband together and stitch. Gather or pleat the top edge of the pants to fit the waistband. If you pleat, start at the crotch seam. About 2/3 of the pleats will have to be double pleats - in other words, a pleat on top of a pleat. make the pleats about 3/4 inch wide. Pleating is more time-consuming than gathering, but the finished effect is more attractive. Attach the waistband, leaving a gap for the elastic. Insert elastic and sew the gap closed. Click on the photo to the right to see the completed outfit in more detail. When you reach step 3, you will need to fold each square along a different diagonal. Cut along these diagonals; you will find that you can pin your triangles together so that the fabric design runs the same way on all pieces. You will need to sew an additional seam along the diagonal. 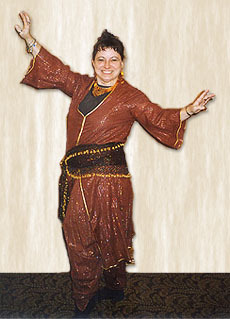 Belly Dance Costume Patterns. For the dancer who would prefer to purchase a ready-made pattern instead of drafting her own. Pants In The Sixteenth Century. Information about the use of pants in historical clothing ensembles. Narrow Salwar: Pants that Need Only 1 1/3 Yards or Meters of Fabric. By Arabella. Ask the Costume Goddess: How to Make Harem Pants. By Dina Lydia. How To Make A Narrow Hem. 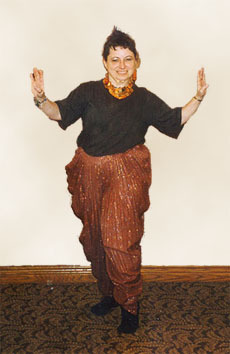 If you choose to put side slits in your harem pants, these instructions offer an easy-to-make hem for finishing the edges. How To Make A Hip Elastic Casing With Wide Bias Tape. A suggestion for an easy way to finish the top edge of the pants. Please visit Arabella's home page on this web site for a full list of articles she has contributed. Arabella began her dance studies with Russian Ballet classes. Frustrated by ballet's impossible ideals, and curious about more ethnic dance disciplines, she moved on to study various other dance forms. 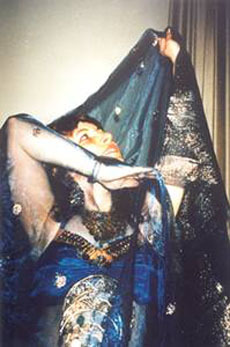 Moving further east each time, these included Spanish flamenco, Escuela Bolera, Middle Eastern, and East Indian Odissi. Arabella, based in Toronto, Canada, is also a certified Mastercraftsman in crewel embroidery, with a special passion for metal thread and ethnic embroidery. Currently she particularly focuses on Palestinian and East Indian embroidery.